It's true: Lady Gaga is back and better than ever. Mother Monster's brand new album Joanne just came out this week and she's rocking it as the musical guest on the Oct. 22 episode of Saturday Night Live. And she gave the audience a taste of her new sound. Lady Gaga performed "A-YO" on SNL , proving she is indeed better than ever. 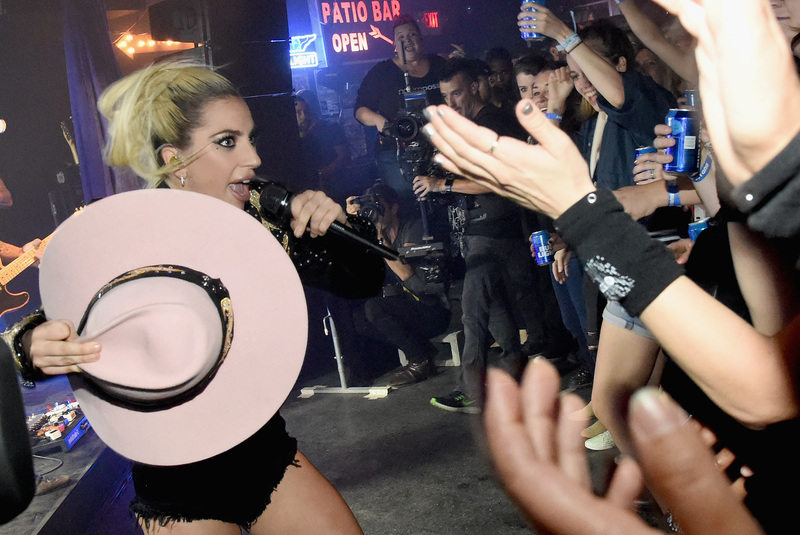 She donned her now-trademark pink hat (from the cover of Joanne) and a glittery crop top for a rendition of the song that was comprised of pure joy from the superstar. Lady Gaga opened the song while singing on a platform surrounded by smoke and she gets lowered onto the main stage. Much like Drake did last year, Mother Monster danced alone as she belted "A-YO" — and she looked like she was having an absolute blast. In the middle of the track, she even lied down on an illuminated tile and showed off her floor dance moves, because she can get down anywhere. Gaga then grabs a guitar and starts jamming along throughout the last part of the song and the guitar solo, proving that she's got the moves and the tunes. It's seriously good to have Gaga back. And according to Twitter, Mother Monster is happy to be back on SNL as well. It may not have felt like it, but Joanne is Lady Gaga's first studio album in two years and her first solo record since 2013. Later in the episode, the singer takes it to a slower pace and croons her single "Million Reasons" as she plays piano. It's as gorgeous as it sounds. So while fans have been waiting a long time for new tunes from the singer, she has made sure they were worth the wait.